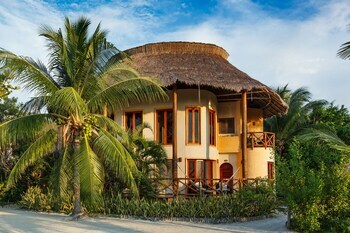 With a stay at Villas HM Paraiso del Mar in Isla Holbox, you'll be on the beach, just a 3-minute walk from Holbox Beach and 12 minutes by foot from Main Square. Featured amenities include dry cleaning/laundry services, a 24-hour front desk, and multilingual staff. A roundtrip airport shuttle is provided for a surcharge (available 24 hours). When you stay at Hotel Akumal Caribe in Akumal, you'll be on the beach, within a 15-minute drive of Akumal Beach and Xel-Ha Water Park. Free self parking is available onsite. Located in Mexico City (Downtown Mexico City), Hotel Dharma is within a 10-minute drive of Tlatelolco and Plaza de las Tres Culturas. Free self parking is available onsite.